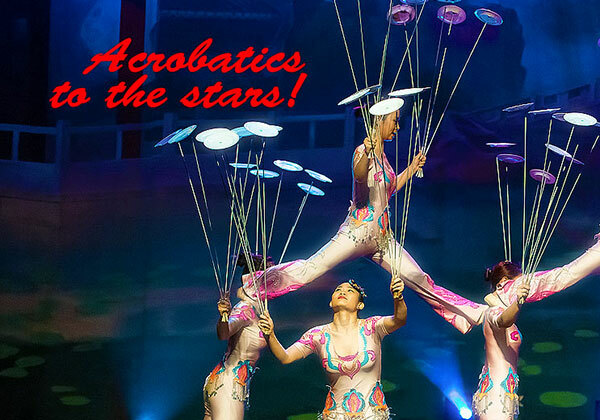 The stars have a different story for everyone, and mine was ultimately connected with the most unlike of things, the acrobatics show at Chaoyang Theater. This is the very beginning towards my passion to theatre performance, but more about that a little later. What’s interesting is that all the stories are connected to each other. It’s a gratifying feeling to know, that you are part of a whole and not just some loose object in space. Everything has purpose, meaning.. every decision you make in your path is for a purpose. Even if the outcome is negative, positive or anything in between there is a valuable lesson to be learned in it. No matter how you try, every turn is inevitable. Otherwise you would not make that turn. With that in mind, it’s beautiful to think how we still are just doing our own thing. It’s that very combination that has personally led me to some extremely interesting situations in life.. situations that I could not anticipate and ones that surprised me because I had never even thought about them and I still end up doing them. This manifestation of my horoscope has often come to me in the form of traveling to China. I have already traveled extensively around the world, and for a long time I hardly even went to Asia. I was mostly interested in Europe, South & North America, Australia.. and if I would go to Asia that would probably be just India and Nepal. Some magnificent place to see the stars and meet wise people who know a lot about horoscopes.. but all the rest of the Asia was totally unforgotten. Until one day, I just ended up visiting for a short while.. it was going to be just a short stop over but something happened and I stayed to live there for almost two years. On that very, same trip! I just sometimes had to visit Hong Kong to get a new visa so that I can extend my stay in the Chinese mainland. Those were the times and the country is still very dear to me. And not just China, but what ended up changing my life for good was the beautiful experience at the Chaoyang Theater venue on my visit to Beijing. This was probably the most unlikely of events to happen in my life, since I never had even the slightes thought about going to see any acrobatics show. Well, as with a lot of stories there was a good Chinese friend who invited me to see it. I thought to myself, that why not and there I went. That was a particularly good day for me.. and that cannot be said about every day in China at all. I was feeling a little excited even, and wondered where this feeling is coming from.. could it be the stars? Surely something was about to teach me a thing or to about life I thought to myself. Well, I went to the show and I ended up loving it. With absolute attention since I could hardly speak throughout the whole acrobatic performance.. there was just something magic in the air at the Chaoyang Theater that was difficult to discribe. Of course, the stunts are amazing.. but that kind of a non-realistic circus-like atmosphere that is actually elegant and made with great Chinese pride. It’s really strange combination of modern performance, and traditional Chinese acts. Many of which almost reached the stars, like the acrobatic performer who was piling two dozen chairs on top of each other, reaching the cealing of the theater building! Oh my god, it was just thrilling and sitting there right in the middle of that fantastic show was too much fun. And the most amazing is yet to come, because I ended up working for the Chaoyang Theater!! Now can you imagine that.. this was the final tipping point of my story and the ultimate destiny of my daily horoscope on that very precious day.. when the moon was at a favorable position. I got to meet the acrobats every day, and work with them.. helping out with the stage and sometimes even giving suggestions on how to improve the show. And that is not said lightly, since it is really considered as the best acrobatics show in the whole of Beijing.. if not the whole of China. It’s a proud achievement, from both me and the peking acrobats themselves of course. If you are interested in the show, or perhaps thinking of visiting Beijing some day.. maybe it’s your destiny.. who knows right! Anyway, I highly recommend that you watch the acrobatic show beijing sneak peak video on YouTube to get a glimpse of what’s to come. It won’t show you too much so there aren’t really any spoilers. No matter how many videos you would watch, it’s always going to be a hundred times more amazing than that. This was the story of my path towards China.. which is one that left an experience for life and continues to live with me. I constantly visit the country and try to invite my Chinese friends.. especially some of the performers (that are unfortunately very busy of course..) to see me here in Minneapolis!